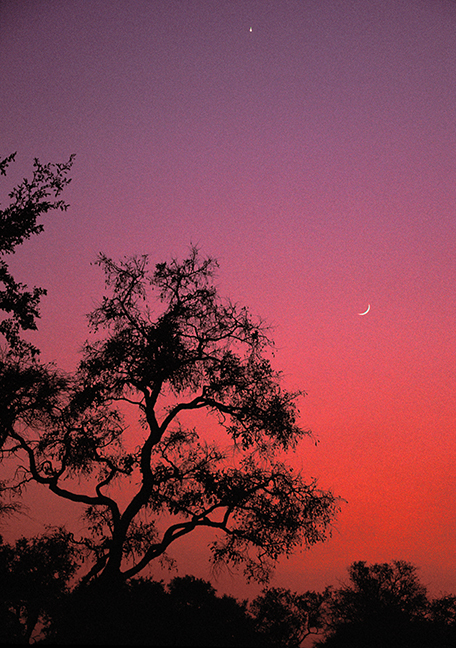 The sun rises and the waxing crescent moon and Venus begin to fade into the daylight near the headwaters of the Xudum River in the Okavango Delta of Botswana. 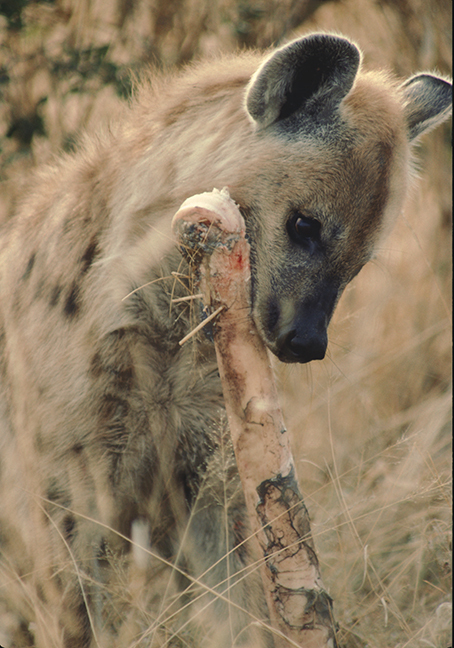 A Spotted Hyena scavenges a giraffe femur after a large pride of lions abandoned their kill along the Savuti Channel in Botswana. Hyenas, jackals and vultures all congregated after the lions moved away to nap. Gemsboks grazing in Etosha National Park in Namibia. 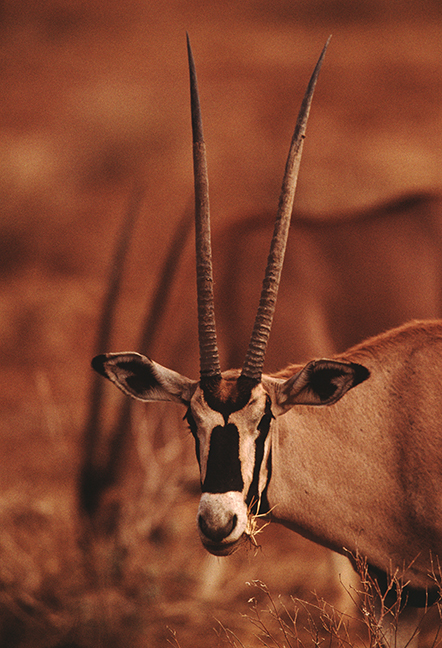 Gemsbok live in herds, usually with a single dominant male, in arid regions of southern Africa where both male and female Gemsbok are hunted for their horns. 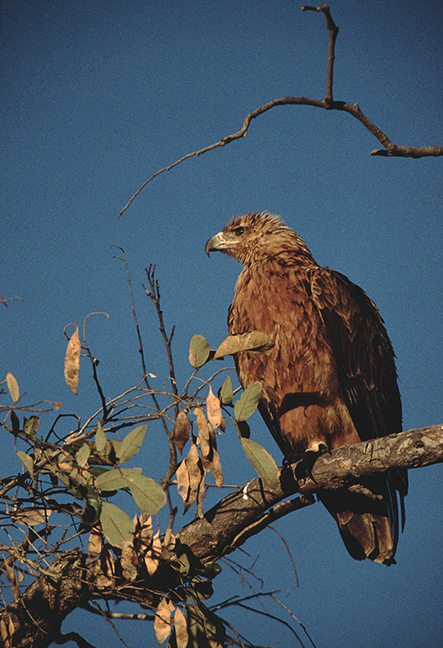 A Brown Snake Eagle, common in southern and eastern Africa, perches on a branch on Chief's Island in the Moremi Game Reserve in Botswana's Okavango Delta. As their name implies, they feed mostly on snakes and their thick-skinned legs provide protection from even highly venomous prey. 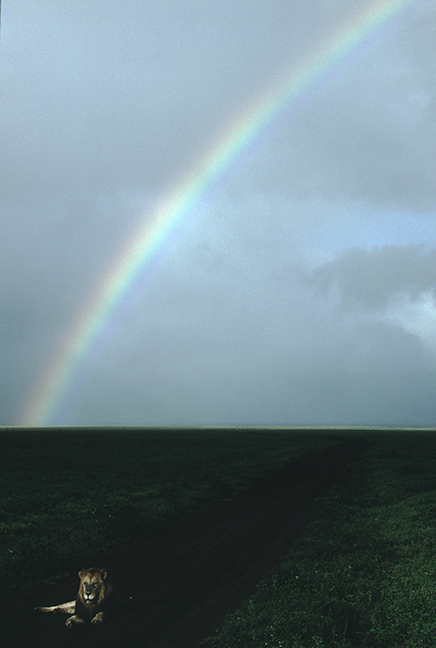 A male lion rests on the road under a rainbow during a rainy afternoon in the Ngorongoro Crater in the Arusha Region of Tanzania. A Black Vervet Monkey rests in a tree in the Ngorongoro Crater in Tanzania. There are numerous subspecies of Vervets, all of which prefer acacia woodland habitats along streams, rivers and lakes where they maintain a mostly vegetarian diet. 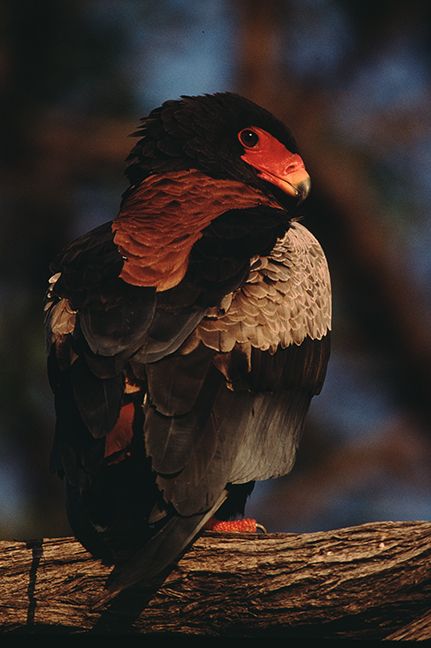 A Bateleur Eagle perches in Kgalagadi Transfrontier Park, which straddles the border between South Africa and Botswana. Bateleurs prefer savanna, grassland and other open areas. They mostly scavenge on carcasses and many have been killed when farmers poison domestic animal carcasses in an attempt to kill predators. A female Olive Baboon cradles her new-born while being groomed by another family member. 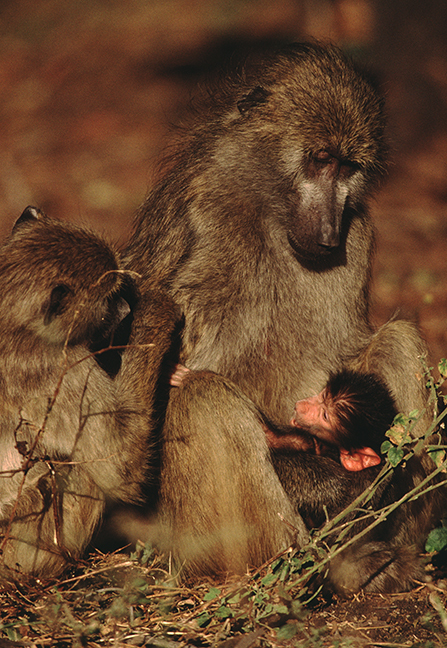 Most baboons live in hierarchical troops and females remain close to their maternal relatives throughout their lives. 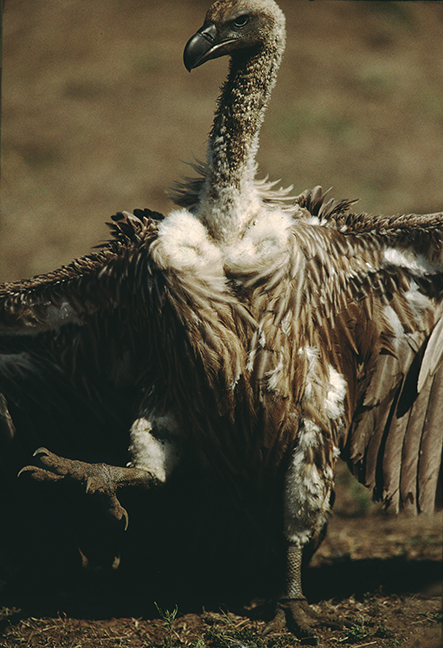 An African White-backed Vulture fights for access to a zebra carcass. Vultures are principally carrion eaters and soar above the plains to spot a meal. Around a hundred of these large vultures can strip a 100-pound carcass clean in about three minutes. 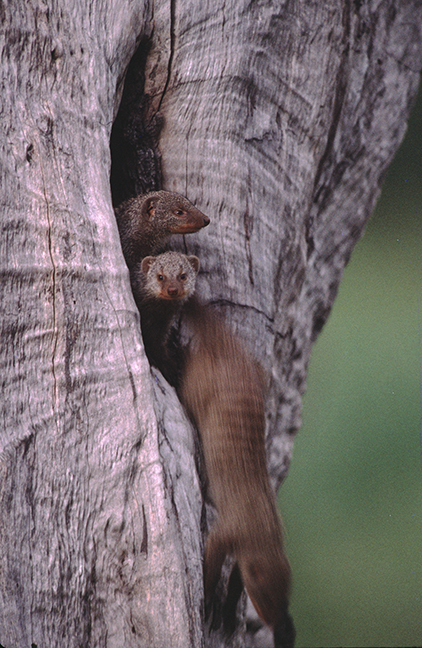 Cape Grey Mongooses rest in a tree hollow in Addo Elephant National Park. The young remain together until they are fully weaned. When not breeding or raising young, mongooses are solitary. 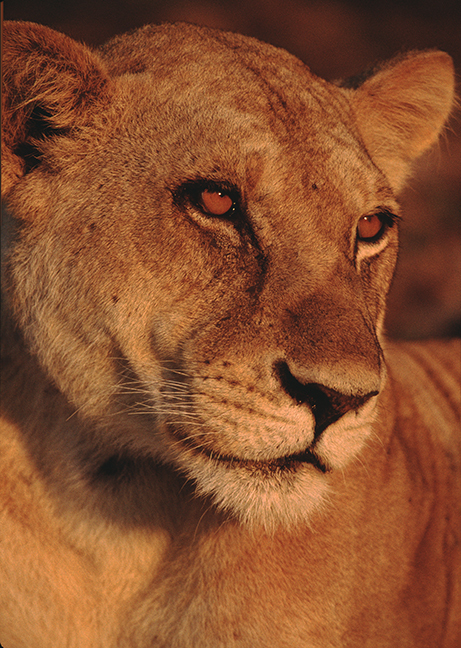 A lioness in the Selous Game Reserve, Africa's largest game reserve, watches her cubs play. There are numerous lioness in a typical pride and they are all usually related. 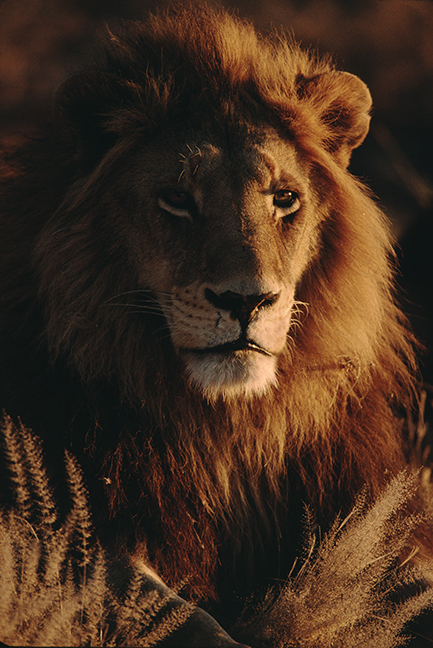 A male lion at sunset in the Selinda Reserve, an area on the western edge of Chobe National Park that borders Linyanti to the East and the Kwando Reserve to the north in Botswana. A leopard drinks from a puddle following an afternoon shower on Chief's Island in the Moremi Game Reserve in the Okavango Delta in Botswana. 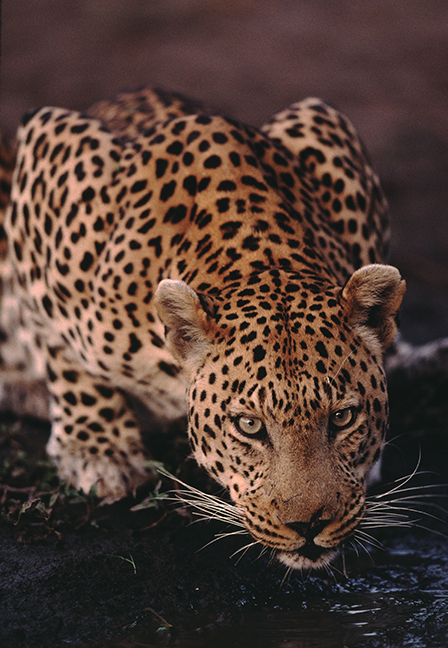 Leopards are nocturnal and solitary. 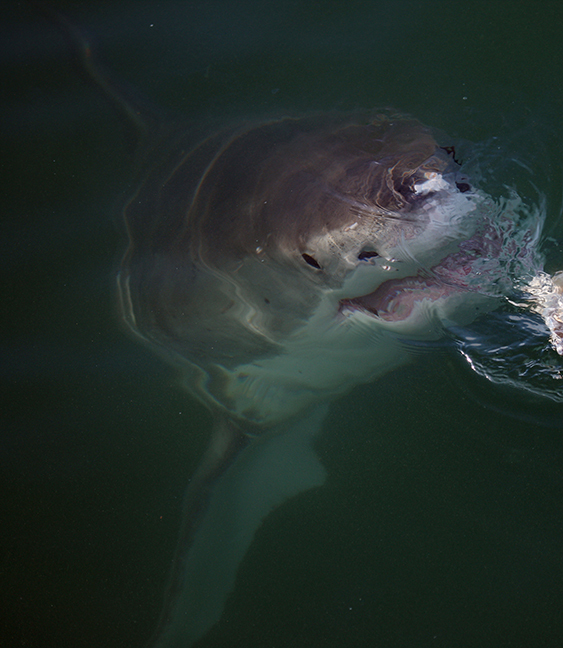 A Great White Shark off the coast of Gansbaai, Western Cape, South Africa is attracted to a tourism boat by a chum slick. Cage diving is controversial as it involves the baiting of an apex predator and has been shown to alter their behavior. A Yellow-billed Stork wades in the shallows of Lake Nakuru in Nakuru National Park, Kenya. 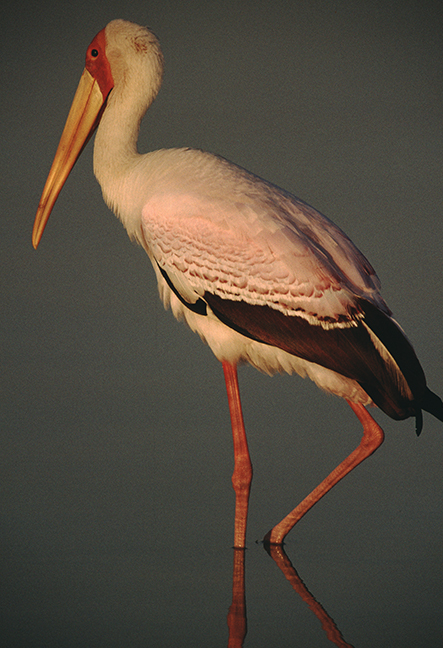 Yellow-billed Storks feed mostly on crustaceans, aquatic insects and frogs, and inhabit wetlands, shallow lakes and mudflats. A Cheetah stalks a hare at sunrise in the Masai Mara National Reserve in Narok County, Kenya. 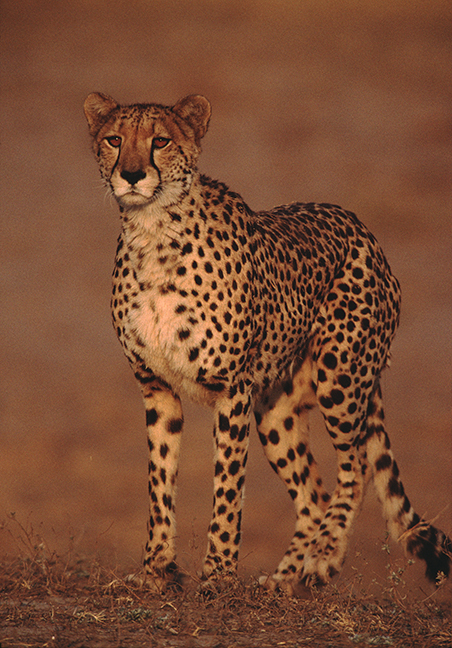 The cheetah is the fastest land animal, able to reach speeds of 75 miles per hour.